June, my birthday month and usually the summer month with the nicest weather, is one of my two favorite times of year, the other being Christmas. My life seems to revolve between the two solstices. 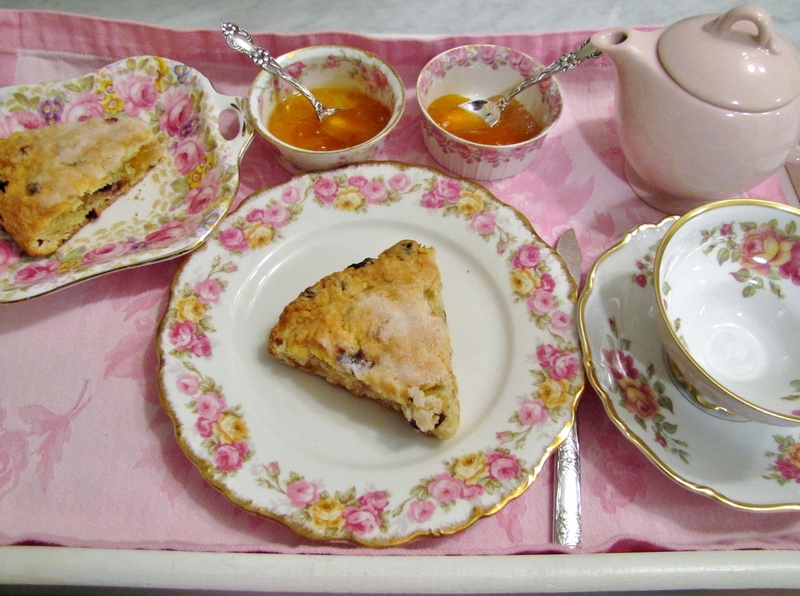 I love to celebrate with nice afternoon teas in June, using my prettiest rose china. Early in June I was thinking of the Queen’s ninetieth birthday celebrations going on in England, and I used my Coronation tea cup with one of my favorite plates. I bought two of those Limoges plates with the green border and the rose garlands at the local thrift shop for a few dollars when I first lived in Jamaica Plain, long ago now. I had this tea on a tray on my chaise longue, which is how I have my afternoon tea now that I’m retired. On another day, when it was hotter, I used a blue setting. I think the turquoise tea cup and saucer and the footed stand are exquisite. Peter won’t join me at tea time, but we have a special Sunday breakfast that is like a tea, and he loves scones and jam and cream at that time. I adore these romantic plates which I found years ago in an antique shop in Cape May, the only time I ever went to Cape May. They come with a set of berry bowls. I always use these plates in June, the time of roses and luscious local strawberries. Besides my home teas, I had several enjoyable tearoom experiences this past month. On the way to Cape Ann for a little vacation, I stopped off in Salem, which seems to be becoming a bit of a tea center, in keeping with its history I suppose. Jolie Tea has moved from Hamilton to an excellent location in Salem, opposite the side of the Hawthorne Hotel. Interestingly, Sophia Peabody Hawthorne lived in this building when she was a little girl. In Hamilton Jolie Tea sold tea and tea wares and books, but was not able to serve tea. In Salem it has become more of a café/tea room, with croissants, macarons, madeleines, and light lunches on offer as well as two set teas, La Petite Tea and High Tea (by reservation). Of course there are dozens, if not hundreds, of teas to be brewed in the shop or bought by the ounce to take home. Many of them are flavored teas blended by Jolie Tea. 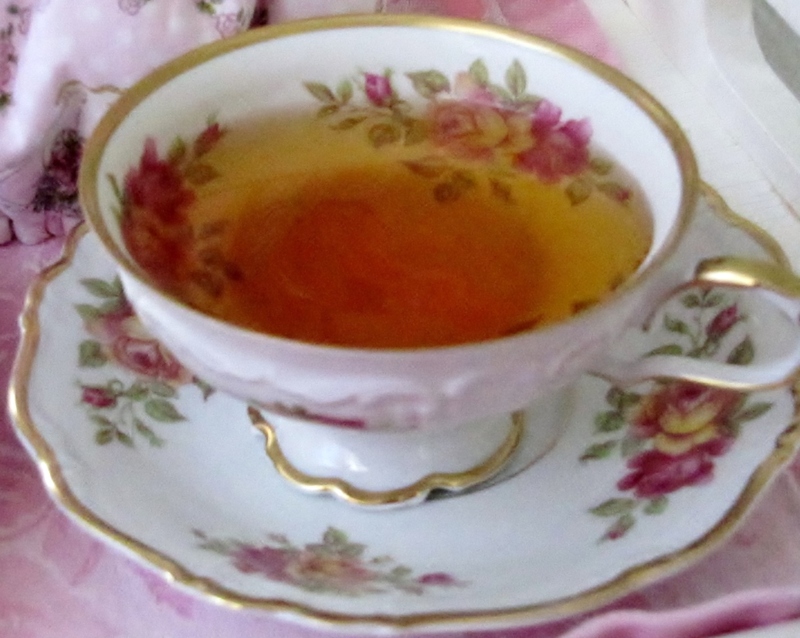 Flavored teas are not usually my cup of tea, as I’m more of a purist, but I must say I like some of these blends, for instance one called “Soiree” which combines three black teas with vanilla and rose petals. I arrived at Jolie Tea about 11:30 in the morning, so I decided to have second breakfast or elevenses, an almond croissant and a cup of simple English breakfast tea. There are three small marble tables set in front of a banquette wrapping around a corner under the pretty windows. I was the only customer for a few minutes. The tea was good, but unfortunately the croissant was not fresh–disappointing in a French-styled tea place. Maybe it would be better another time. 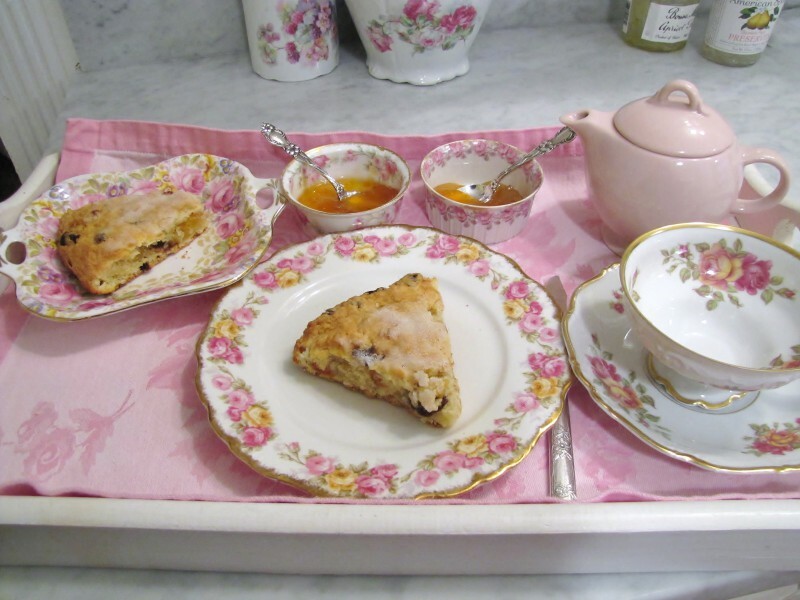 I will try “La Petite Tea” on another occasion, which consists of a scone, a madeleine, a macaron, and a pot of tea. It’s so hard to get good tea when out and about in the U.S.; even in places that should know better, the tea is almost never prepared properly. Therefore I welcome the presence of any tea shop like this, that has good teas and knows how to brew them. In England you can count on getting a good strong cup of tea, brewed in a teapot even if with teabags. It may not always be fine tea, in fact it usually isn’t, but at least it’s not the warm flavored water sort of thing that passes for tea in this country (a tea bag set on the side of a cup of not-boiling water!). It reminds me of what the tea expert James Norwood Pratt said in a recent article–that he would rather have ordinary tea well prepared than fine tea that is not properly made. The teas I took home from Jolie Tea have been very nice: a light Cheericup Ceylon for the summer, an excellent Temi Estate Sikkim tea, and the Soiree blend. There is another French tea and pastry place in Salem, Melita Fiore, on Washington Street just two blocks from the train station (as I discovered last December when I took the train to Salem for the House Tour). It has a lovely white interior with café tables and curvy chairs, a chandelier, and large windows. The bakery cases are full of fancy pastries, cupcakes, and macarons. So far I have not had the chance to sit down here and have tea. In December I took a cup of Darjeeling, brewed from loose leaves, and a macaron with me to the train station to have while I waited, and both were excellent. I definitely plan to return here, with a friend I hope, and enjoy the elegant atmosphere along with tea and pastry. Later this summer the Peabody Essex Museum will be having an exhibition Childe Hassam on the Isles of Shoals, which I want to see, and that will give me a chance to try Melita Fiore. Continuing on to Cape Ann on my recent excursion, I drove around the back shore of Gloucester, rolled the windows down and breathed in the fabulous sea air as I watched the waves coming ashore on the rocks while driving as slowly as I could along the coast. I passed Good Harbor Beach and continued into Rockport on Thatcher Road (127A), a very pleasant drive in the south end of town. I decided to have lunch at Heath’s Tea Room in Rockport, a relaxing place about half a mile from the center of the village. As it turned out, there were almost no vegetarian options for lunch, so I had the “Dartmouth,” the smaller of the two set teas, which comprises six tea sandwiches, a scone with butter and jam, and a pot of tea (no sweets course). I asked for vegetarian sandwiches only and was given cucumber, always a favorite, and some very nice ones made with whipped cream cheese and slices of fresh strawberries. I do think it was regrettable that both were on white bread; however, I enjoyed them. Several kinds of scones are always available, and I chose cherry walnut. Heath’s scones are quite delicious and fresh. They are definitely the American type of scones, which I have never seen in England, triangular and with add-ins, but good for what they are. The tea room is decorated with pretty china, which is for sale, but the china I was served on was very ordinary, a plate and tea cup I wouldn’t have in my own house. This is unfortunate, as lovely china is to me one of the most enjoyable elements of tea time, and I take great pleasure putting together my tea settings. Still, even though Heath’s is not everything I could wish for in a tearoom, I’m very glad there is a tea room in Rockport these days, and I go there almost every time I’m in Rockport. To top off the month, on the afternoon of my birthday Peter joined me for tea in the Courtyard Restaurant at the Boston Public Library. We were given the table by the windows looking out at the fountain in the library’s wonderful cloistered courtyard, one of my favorite places in Boston. The room is elegant and restfully quiet, and the service is excellent. Our waitperson coped calmly with my being a vegetarian and Peter’s not drinking tea and asking for simplified versions of the tea sandwiches. With her help and mine, he chose a delicious, refreshing drink made of a puree of fresh cherries and soda water; other fruits were also available. This is the display at the entrance to the Courtyard Restaurant. Here is Peter contemplating our tea assortment. I had cucumber with lemon cream cheese and mushroom butter sandwiches, among others; Peter had ham and deviled chicken, having rejected the smoked salmon and the shrimp salad. The scones are small, which is quite appropriate as part of a large tea, and are served with clotted cream and apricot jam and lemon curd in little glass jars. They’re a bit hard, but they do well enough with the jam and cream. I’m not sure why they give apricot jam here–to be different, I guess. Strawberry is the classic because it’s the best! Anyway, the sweets course is quite nice, best of all the fruit tart with custard and the macarons. I had a good pot of Darjeeling to accompany all the little savories and sweets. This is where I had one of my retirement parties two years ago, with twenty-one current and retired MassArt faculty. I reminisced quite a bit about that grand occasion, which marked the completion of a thirty-two-year career and the beginning of my fabulous retirement. Our faculty member Laura Reeder recorded the occasion, and so I have a collection of photos of the party. I really should make a book with those photos and the ones of my other two parties at MassArt, the alumnae party and the staff party. I thoroughly enjoyed my birthday tea. We stayed a good long time, and it was a setting most conducive to quiet conversation. There were only a few other tea takers while we were there, a father and daughter, a mother and daughter, pairs of friends … all very tranquil and delightful. Even Peter enjoyed it, and he was only there because it was what I wanted for my birthday. I’ve been living what often seems like a charmed life in the beautiful month of June, for which I am full of gratitude. June 1st has been a lovely day, after a hot and humid May 31st. A north east breeze was blowing, and we had a delightful walk at the Pond. All is green now, so refreshing and soothing. There is much new life among the water fowl. I saw the nine ducklings for the first time, just a few days old. We’ve seen two small groups of goslings in the last week or two, and today we came across the latest goose family, resting on the back shore of the Pond. Seven goslings! I think this is the mother goose who was nesting on the hill. I was transfixed. What is it about baby animals that appeals more than baby humans? Everyone seems to love them. As I watched, the little ones gathered around their mother, and she let some of them crawl under her wing. It was one of the sweetest things I’ve seen. All together, mother and babies. Just look at the one little gosling’s head sticking out from under its mother’s wing! I had to tear myself away from this heartwarming scene as Peter was waiting. I’ll look for this goose family every time we walk around the Pond. The early summer flowers are out at the Pond and in gardens on Pond Street. Later, in the afternoon, I prepared a tea tray with my June plate and teacup and had a lovely tea on the chaise longue, with soft breezes wafting in the windows. It gives me great pleasure to use my china in a seasonal way, and so I only use the June china in June and enjoy it all the more when its turn comes around. June is my birth month and a special time for me every year. Welcome June! Most afternoons at home, now that I’m retired, I like to have tea about four o’clock and set up a pretty tray to take into the living room. One of the parts of the ritual I enjoy most is choosing a seasonal grouping of china. Here I’m using a favorite pink and yellow rose Limoges plate with a graceful Bavaria tea cup, which has one of the most beautifully designed shapes of all my cups so that it feels really well balanced in the hand. The small plate on the left is part of a trio that was given to me years ago by one of the Art Education faculty, Christy Park; she told me she got it at Virginia Kropas’s yard sale (one of our alums), and it had been Virginia’s mother’s. I met Virginia’s mother a long time ago and liked her very much, so I treasure the connection. The little pink tea pot I found just last June at the Wenham Tea House. It’s just the right size when I’m having tea alone. On this occasion I had dried fruit scones, which I had made the previous Sunday morning for our special Sunday breakfast. They have dried apricots, cherries, pears, and golden raisins in them and melted butter and sugar on top! I like them in the fall with peach or apricot jam. Margaret’s Hope Darjeeling or Temi Estate goes beautifully with the scones. I take my tea tray to my chaise longue in the front windows and sip tea and nibble a scone, my legs tucked up in cotton blankets and a stack of reading material beside me on the table. Tea time is always one of the best hours of the day.